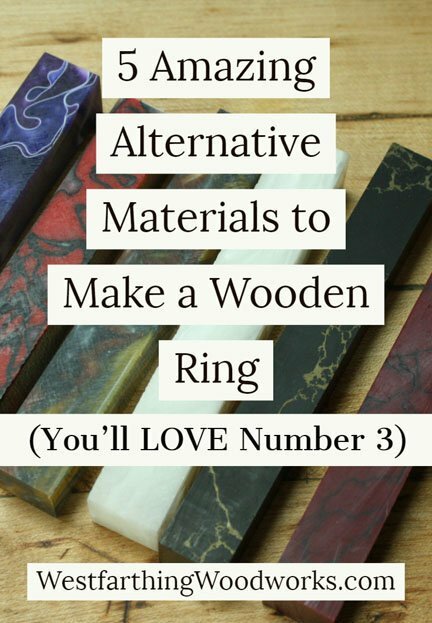 This is 5 Amazing Alternative Materials to Make a Wooden Ring. Did you know that not all wooden rings are made from wood alone? 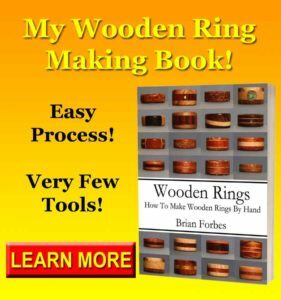 There are many other types of materials that can help you make better looking and more interesting wooden rings. Wooden rings are very popular, and there are a lot of creative and talented people making beautiful pieces in their shops. That being said, did you know that you can use a lot of materials other than wood in your designs? Wooden rings are normally made from wood, but there are a lot of other interesting and fun materials out there if you look around. 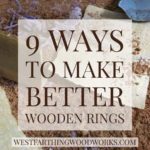 There are plastics, bone, metal, and more non-wood materials that you can add to your wooden rings and take your designs over the top. 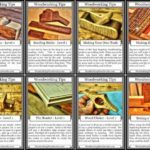 Here are a few good ones to get you started, and all you have to do is get them into your shop. That’s the biggest hurtle, because once you have them, you will really love what you can make. The turning industry has a huge involvement in plastics, and bringing plastics into the woodworking field. Lathe workers and hobby turners now send as much time or more turning plastics as they do turning wood. The material is made for smaller projects in general, but it comes in a number of different sizes depending on what you need. These are not solid color plastics like you might think. These are incredible art pieces themselves. If you look for a pen turning supplier, you will see the examples. They are both numerous and interesting, and can really make your designs look amazing. The pieces sold for bottle stoppers and duck calls are about the right size for making wooden rings. Simply add a layer of acrylic or another plastic to your lamination and you are in business. The material cuts and shapes almost like wood. The only big difference is they heat up quickly, so you need to cut and drill in a way that does not make a ton of friction. 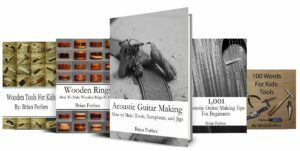 My 35 Important Tips on How to Make a Ring is another huge resource that I made for new ring makers, and it can help you make better rings. Bone is an interesting natural material, and depending on how you feel about the issue you can go your entire life without ever using it and still make beautiful rings. However, there are a few ethical places that you can get bone blanks. Bone has been used in jewelry and ornamentation for thousands of years, probably even more than that. When you use this material, you are sharing an experience with makers of jewelry from long ago. 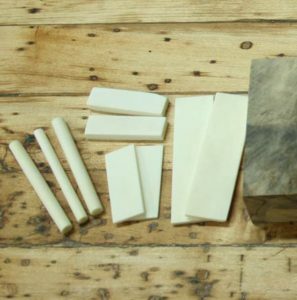 Small bone sheets can be layered in between wood and other materials to make a lamination, and that can be made into a ring. You can also use bone for inlay work on your wooden ring, and it has a vary unique appearance. 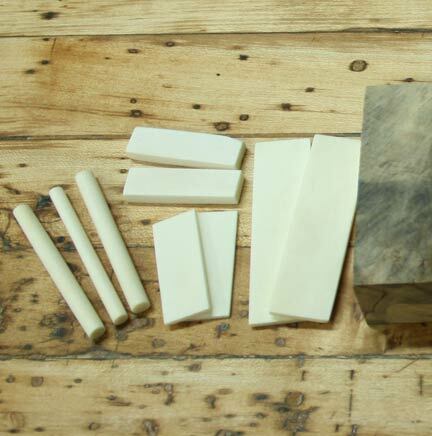 If you can’t bring yourself to use real bone, you can always find plastic blanks that simulate the look of bone. These are available from the same wood turning suppliers, and they come in white and black typically. Bone is also one of several Inlay Materials for Making Wooden Rings. This is another great way to add depth and interest to your wooden ring designs. This is a fun material to use. Small sheets of thin metal like brass, copper, and steel can be found in smaller hardware stores as well as online. These thin sheets are easy to cut with a snips or a shear, and you can laminate them into your ring designs. This is one creative way to make your rings last longer, and hold up better. A couple thin layers of metal inside a wooden ring lamination give you some real strength, and they also allow the look of the wood to shine through. In this kind of arrangement, the beauty of the wood and the strength of the metal work together to make a long lasting ring. The ring is also beautiful, and is easy to see as being a wooden ring even with the help from the metal. 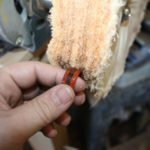 If you are concerned about How Durable Are Wooden Rings? You can find the answers in the post, and learn how to care for your wooden ring. There are also thin sheets of colored plastic that you can find. They also come in a number of colors and patterns. 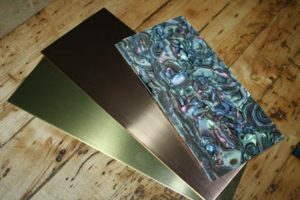 Being a guitar maker, I have thin sheets of plastic that looks like Abalone shell. This makes for an interesting layer. You can find this in tortoise shell too. This is a common older material that was used to make guitar picks before plastics came in and took over. A little online searching and you can find a lot to see with a few clicks. If you want to go to a store it can be harder to find things like this, so do the majority of your searching online. You may end up with something that works just fine on the faces of your ring, or in the center of a lamination. 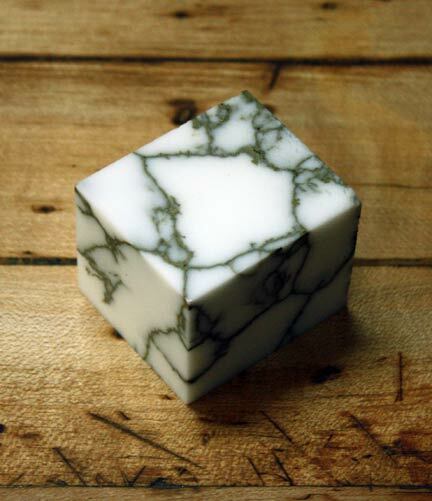 This is a man made material that is a dense and heavy substance designed to look like natural marble or stone. The colors and designs range, and they all have an interesting look. They also weigh a lot, and are a bit more expensive than plastic blanks. Tru-Stone comes in a number of colors and sizes. If you are going to make a ring from the material, I recommend that you look for a bottle stopper blank. This will give you a good amount of the material without spending a ton of money. The material works like a dense wood, but be careful not to chip it out. It is easy enough to work into your designs, and a thick layer in the middle of a lamination can have a strong look on a handmade ring. Now that you know a lot about alternative materials for making wooden rings, you need to know where to find them. I recommend starting out with your local fine woodworking store, because they will have materials you can see and touch. Once you understand what the materials look and feel like it’s easier to buy them. When you don’t know, you might not get what you want. Shopping online can be a little bit of a shot in the dark if you have not physically touched the item before. You can also find ring making materials in a lathe turning supplier, or their online store. Lathe turning has brought a lot of non-wood materials into woodworking, and they are all welcome additions to the craft. Non-wood materials glue together differently than wood materials. When you glue together plastics, bone, shell, or metal, wood glue will not cut it. Instead, use a good strong two part epoxy to hold everything together. I recommend using a Name Brand Two-part Epoxy, because you are trusting your entire ring collection to hold together with this adhesive. Don’t save a couple dollars and wonder how well the glue will hold. Buy a good epoxy with a 60 minute open time. This means you have 60 minutes to get the epoxy where it needs to go. After that, it starts to gel and get too hard to spread. 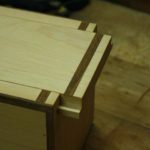 On larger glue ups, this is a nice advantage, because you are going to need some time to get it all together. Also, nearly all epoxy types take about 24 hours to fully cure. Even the five minute open time variety needs 24 hours for a cure. This means you are not saving any time by getting the faster setting type. You are only making your job of getting everything in the clamps harder. Your homework is to look into some of the alternative materials that you can use in your wooden ring designs to make them pop. Start with the lathe turning suppliers online, and look at the wide range of materials that they offer. If you are not inspired by the sheer range and number of these materials, I will be shocked. Some of them are truly amazing. You can even get combination pieces. 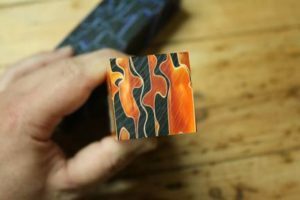 This is where a piece of amazing looking wood is cast inside colored resin. Take some of these materials home, or make a small order online. Bring the materials out when you are making your lamination and try them out. Like anything, they will be different, but the looks should also be inspiring, and that can mean all the difference in your designs. Wooden rings are normally made from wood but they can also be made from several other alternative materials too. 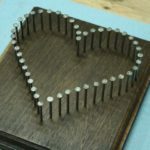 There are a number of great materials out there that will make your wooden rings pop, and set off the look of your designs. There are plastics, bone, metal and more. All you need to do is take a look around and you will see that there is a lot out there. I recommend getting a few of these materials and bringing them into your shop to test out. When you get them in there, start adding them to your laminated rings. The way you combine and design is the same as with wooden rings, you just need to use a strong two-part epoxy to hold the pieces together really well. After that, carve or turn your rings the same way as you would normally, and enjoy the difference that these non-wood materials can make in your rings.